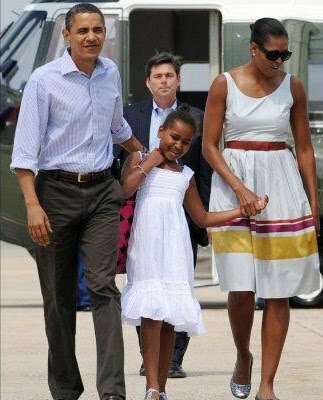 It’s been a minute since I had my Obama wardrobe fix, but Ms. O does not fail – as she sports a sleeveless Sophie Theallat dress, hair pulled back, and fab stunna shades. Is that a pair of silver metallic flats I see? Oh, Ms. O, the island don’t know what hit em! And the young ladies look cute too. 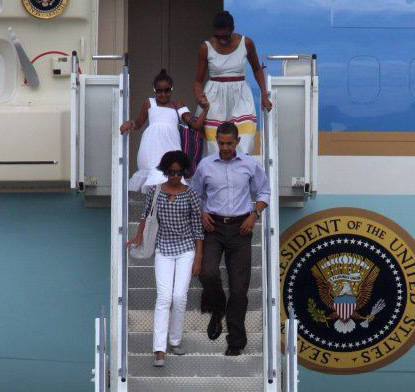 Look at Malia with her white skinny jeans and plaid peasant top – loves it. This family is so fly!